Is it desperation? Restlessness? Sheer boredom? Whatever it is, I've stooped to a new low in my quest to mystery shop across America... the truck stop shower. In fact, I've shopped six truck stop showers this week. They've ranged from gross, like the one with a splash of dried pee on the toilet seat, to homely, such as one that featured a bowl of mints on the counter. I've never used a truck stop shower before so I've learned some things. First, it's expensive to bathe on the go. A truck stop shower ranges from $10 - $12. When you purchase a bath, the cashier gives you a receipt with a code on it. Some of the truck stops list the shower number on the receipt and you go to that shower, enter your code, and the door buzzes open. Others require you to watch a video monitor and wait for your customer number to come up to see which shower you've been assigned. The showers tend to be low end but mostly clean, more like an Econo Lodge than Hampton Inn. You get a sliver of a bar of soap, a towel which might not smell of diesel fuel if you're lucky, possibly an oscillating fan, and your very own toilet. The toilet part could be handy when it's clean enough to use. I won't complain about the money, though. I've earned $150 shopping these six showers. 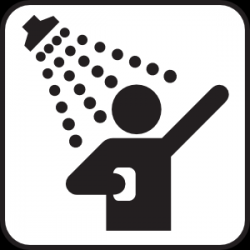 truckers should do these to get their free shower. Of course, they get a free one if they fill up too.